Make the most of every opportunity to grow your business. How the lowly business card can seriously boost your authority. Have you heard that “Print is Dead”? I heartily disagree. In content marketing, where you freely share relevant information to attract and convert prospects into customers and hopefully repeat buyers, print materials can be a crucial part of the mix. There is plenty of room for printed materials in permission marketing as well, where you honor the privilege of delivering pertinent messages to people who anticipate them, rather than carpet-bombing the masses with ads, television commercials or junk mail. Sometimes your customers are not online. Sometimes your potential customer is standing in front of you, and you are having an honest-to-goodness face-to-face human conversation. In a fleeting moment, you are asked for contact information. You don’t hesitate. You don’t grapple with pen and paper. You don’t fumble your phone. You instantly produce a professionally-designed business card. Yes, the lowly business card can still fill an important role. There was a lengthy discussion last year in a LinkedIn group of communications professionals about business cards: Are they dead? Who needs them? Just bump your phone with someone to exchange contact information. But your business card goes above and beyond the communication of basic contact information. It carries your business identity and branding elements. It makes a critical first impression with prospects, and can immediately boost your authority. Your card also can augment your sense of confidence when you are meeting and interacting with new people. Do you have a business card? What does it look like? Is your card a do-it-yourself number, printed slightly crooked and popped out of a perforated page? Or is it professionally designed and printed, impeccably branded? If it falls face down on a desk, is there some sort of message or supplementary information on the back about your offerings, like a mini brochure? The importance of having a professional business card played out right here just the other day. Harry Sircely, in search of fertilizer inputs to improve our new vegetable garden, walked up to one of our neighbors who was cleaning up after her alpacas. They introduced themselves and had a long, neighborly conversation about chickens and alpacas and gardens and the usual topic, “How did you end up here on Orcas Island?” She offered him copious amounts of manure and wondered what he might offer in exchange. “I’m a photographer,” he said. They talked some more. He produced his business card and she was drawn to the stunning images printed on each side. “Oh, you ARE a photographer!” she exclaimed. Apparently these days, ‘everybody’s a photographer,’ and his business card served as evidence, proof of his talent. Professional image conveyed. Contact information delivered. Cost of full color, two-sided card: 3 cents. 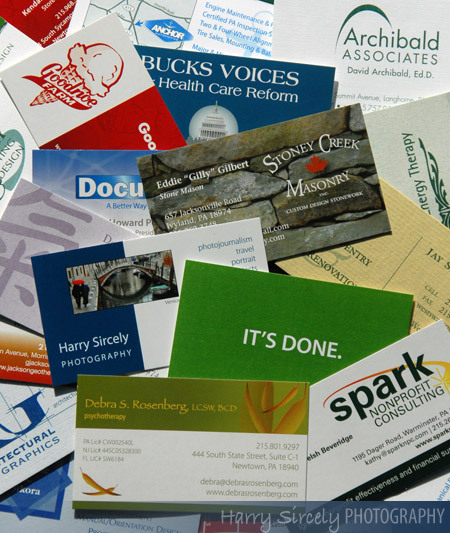 Take a few minutes to analyze your current business card. Does it really tell someone what you do? Are the images and typestyle in tune with your branding, and do they convey the image you want to project? Is all the contact information up to date? Are you using both sides, or a fold-over card with four panels? Do you include a QR code to direct prospects to a relevant page on your website? If you want to bump phones to exchange information with someone, that’s fine. You still need a business card for occasions when the human conversation and the tactile offering of a printed card builds your authority and helps to seal a new business relationship. Click here for a free subscription to Enterprising Marketing. Enter your email address to receive notifications of new posts by email. Have You Helped a Woman in Small Business Lately?